The Finnish winter can be cold and dark but that’s no reason to get depressed. Janne Käpylehto showed it only takes a man, a chainsaw and some ingenuity to create winter fun. His huge ice carousels have been the latest craze in Finland – and around the world. 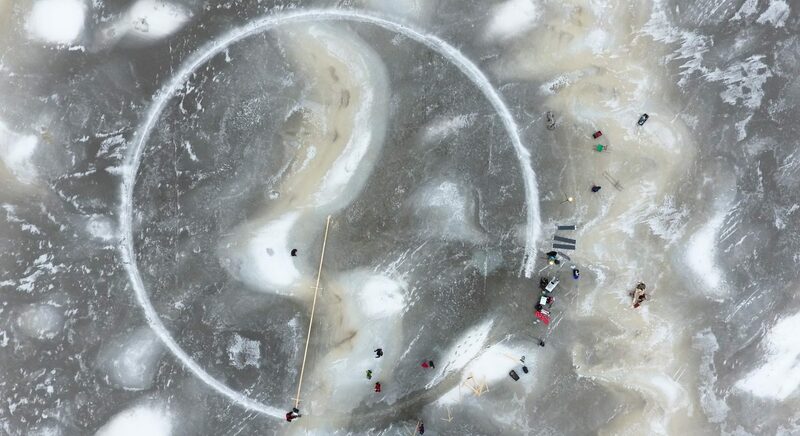 A circle of ice 57 meters in diameter and some 800 tons in mass, rotating at walking pace on a frozen lake, powered by an electric outboard motor. That is an ice carousel, the biggest yet, built by Janne Käpylehto. He is the man who made ice carousels the latest buzz word in winter activities. “I wanted to show the world that Finnish people know how to have fun in winter”, he says. It all started in the small town of Lohja, Finland, where Käpylehto, a Finnish writer and energy expert, built an ice carousel in front of his cottage. He cut a circle on a frozen lake with a chainsaw and used an Evinrude outboard motor to make it spin. The video of the operation went viral. The amount of interest has taken Käpylehto by surprise. He has been interviewed on BBC, Reuters, a few Japanese television stations and many more. Requests for an interview keep coming every few days. Ice carousels have been around for some time, but Käpylehto invented a machine that helps build big ones with precision. The device is like a giant pair of compasses with a chainsaw at the other end. “The most important thing is to have the chainsaw in the right angle so that it cuts through the ice neatly. There mustn’t be any slushy ice on the edge of the carousel or it won’t spin”, Käpylehto says. Ice carousels are an environmentally friendly pastime. There is no waste in the process. Just cut a circle in the ice and make it spin – either by muscle power or with a help of a motor. Käpylehto has used solar powered electric motors to make the carousels go round. “People seem to think that it takes a lot of energy to make the carousel spin. That’s not the case. The friction is minimal and 20-40 watts is enough to make it spin slowly. Once you get the carousel going a bit faster, it can keep on rotating by itself for up to an hour”, Käpylehto says. He has built a dozen ice carousels this winter, mostly around the metropolitan area of Helsinki. There has even been a live concert with a band playing on an ice carousel accompanied by a spectacular light show or people enjoying a sauna in a tent set up on a rotating ice carousel. “People have been so excited. I’ve been told by many that it’s the most fun they’ve ever had on ice. It’s amazing!” says Käpylehto. Building the biggest ice carousel soon became a competitive sport. Some guys in Tartu, Estonia, built one that was a bit over 60 metres in diameter. That’s why Janne Käpylehto plans to build an even bigger one. The next one will be 100 metres in diameter – to celebrate Finland’s 100th anniversary this year. On the video you can see a 57-metre ice carousel made by Janne Käpylehto in Kirkkonummi, Finland.